Interest rates on US 30-year fixed-rate mortgages fell to 5.52 percent late Monday after hovering at 5.67 percent on Friday, according to real estate Web site Zillow.com. That is down sharply from a week earlier when the mortgage rate was around 5.72 percent, according to Zillow Mortgage Marketplace. The lower rates reflect a fall in yields on US government bonds, which are linked to the mortgage market. The rate, however, is sharply higher than the roughly 5.00 percent level seen at the end of May and at the beginning of this year, Zillow said. The move higher in mortgage rates recently collapsed home loan refinancing activity. 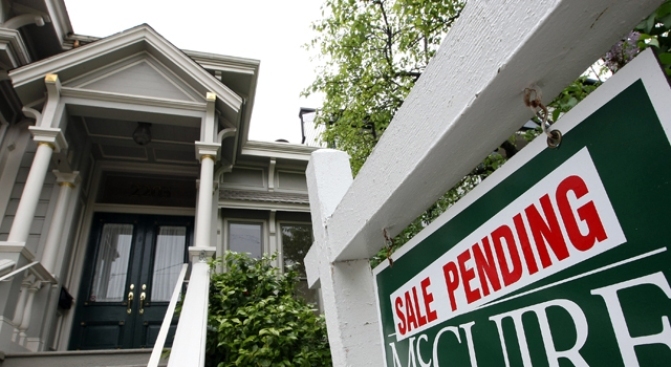 The worst of the U.S. housing market's meltdown, however, may be over. Michelle Meyer, an economist at Barclays Capital in New York, said the housing market's deep recession has started to bottom with a leveling off in home sales. Builders have slashed construction, so that inventory of new single-family homes is falling at a record pace, with starts at or close to the bottom, she said in research published Friday. The last element to bottom probably will be home prices, with national home prices expected to fall a cumulative 40 percent from the peak through the second half of 2010, she said. The battered U.S. housing market, which is in the midst of its worst downturn since the Great Depression, is both the source of and a major casualty of the credit crisis. A setback for the market could hamper a turnaround of the U.S. economy.